High-quality reporting set: ME 4 cardioid clip-on microphone for prominent voice reproduction free of background noise, EK 100 G3 adaptive diversity receiver, SK 100 G3 bodypack transmitter. The flexible, durable and simple-to-use EW 122-P is well suited to video recording and presenting. 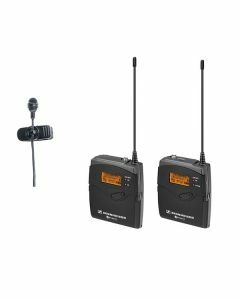 The ME 4 cardioid clip-on mic comes with EK 100 G3 adaptive diversity receiver and SK 100 G3 body pack transmitter with mute function. The EW 122-P G3 should be a mandatory addition to any video reporting unit. A design centred on high performance and portability does not compromise on its internal specifications. Sennheiser’s cardioid mic is complimented by a straightforward graphic display and simple menu. The highly directional mic’s clip-on is conspicuous and utilises a body pack transmitter with mute function to provide crystal clear sound. The adaptive-diversity receiver keeps excellent reception. Both are insubstantial to mount and intuitive to use without conceding capability or toughness. Channel 38 (606.500MHz to 613.500MHz) is available all over the UK, Licence REQUIRED. The "800MHz duplex gap" (823MHz to 832MHz) is available all over the UK, Licence REQUIRED. 'Channel 70' (863MHz to 865MHz) is available, Licence exempt (FREE), up to four frequencies can be used simultaneously. UHF TV Channels 21 - 37 (470MHz to 606MHz) and 39 - 60 (614MHz to 790MHz) may be licensed for use depending on exact location and time period required. 1785MHz to 1800MHz is available in England, Wales and Scotland. Licence REQUIRED. NOT available in Northern Ireland or the Republic of Ireland. Sound pressure level (SPL): 120 dB(SPL) max.